Get a great experience: walking on the tidal flats in the Wadden Sea with the ‘Vrije Wadlopers’. 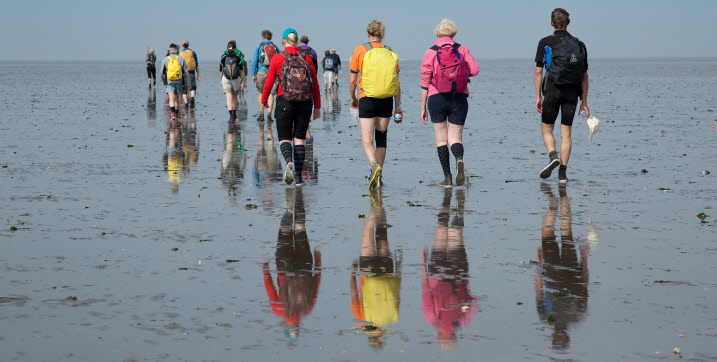 Wadlopen (translated: intertidal guided tours, mudflat / sandflat hiking, hiking on the tidal flats) with ‘Vrije Wadlopers’ (translated: ‘Free Mudflatwalkers’) is focused on small groups and is educational, energetic and safe. We are keen to share the experience of this unique mudflat wilderness, stunning panoramic views and sporty activity with you! We have a relatively limited fixed program. You can find this under the tab ‘Program’ and under ‘Tours’. Are you unable to find the date that suits you most, or are you looking for a tour with special features (poetry, photography, for visually disabled, teambuilding, etc) please contact us at aanvraag@vrijewadlopers.nl. We will try our best to cater for your needs!